Dr. Tom Buijse (1962) is a specialist in freshwater ecosystem health and restoration. He obtained his PhD degree in 1992 on fish population dynamics in a large shallow freshwater reservoir. From 1993 onwards his research and consultancy concentrated on the ecological rehabilitation of large rivers such as the Rhine, Danube and Volga and the fish communities as indicator for freshwater ecosystem quality. 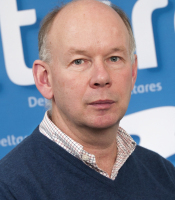 His expertise on the potential to restore freshwater ecosystems was subsequently applied to implement the European Water Framework Directive in the Netherlands and to develop fish-based assessment methods for rivers. He has 35+ peer-reviewed scientific publications and was the prime organiser and guest-editor for an international conference on large river rehabilitation in 2003. The present research focuses on the hydromorphological rehabilitation of rivers. In 2009 and 2010 he co-lead the international project FORECASTER aiming to facilitate the exchange of knowledge on the ecological effect of hydrological and morphological degradation and restoration of rivers. From November 2011 onwards he coordinates a 4-yr large integrated EU-funded research project REFORM (Restoring Rivers for Effective Catchment Management) involving 25 European partners. His 20-yrs research and consultancy experience covers rivers, floodplains, lakes and deltas. His citation Hirsh’s h-index in Scopus is 12. 2008 - present Deltares Department of Freshwater Ecology & Water Quality, specialist ecology. 1998 - 2008 Rijkswaterstaat - RIZA Ecology Department, senior advisor/specialist. 1993 - 1998 Rijkswaterstaat - RIZA Research Department, senior researcher. 1992 - 1993 Wageningen University Department of Fish Culture and Fisheries. Vice-project coordinator; responsible for scientific support of research projects in developing countries. EC FP7 (Grant no 282656). Role Project coördinator. (EC-FP6). Role: chair of the advisory board; scientific partner. Cooperation between RWS-RIZA and Wageningen University to identify steering variables, that influence the ecological states of floodplain lakes along the River Rhine. This to develop guidelines for conservation and rehabilitation. Cooperation between RWS-RIZA, Wageningen University en the Organisation for Improvement of Inland Fisheries. Assessing the potential of river rehabilitation projects for fish communities in large lowland rivers. Interdisciplinaire cooperation between the Danube Delta National Institute, the Danube Delta Biosphere Reserve Authority en RWS-RIZA. Górski, K., J.J. De Leeuw, H.V. Winter, D.A. Vekhov, A.E. Minin, A.D. Buijse & L.A.J. Nagelkerke (2011). Freshwater Biology. 56: 2210–2225. doi:10.1111/j.1365-2427.2011.02647. Coops, H., L.L. Buijse, A.D. Buijse, A. Constantinescu, S. Covaliov, J. Hanganu, B.W. Ibelings, G. Menting, I. Navodaru, W. Oosterberg, M. Staras & L. Török (2008). River research & applications 24: 698–709. Roozen, F.C.J.M., E.T.H.M. Peeters, R. Roijackers, I. van den Wyngaert, H. Wolters, H. de Coninck, B.W. Ibelings, A.D. Buijse & M. Scheffer (2008). River research & applications 24: 388–406. Leeuw, J. J. de, A.D. Buijse, G. Haidvogl, M. Lapinska, R. Noble, R. Repecka, T. Virbickas, W. Wiśniewolski & C. Wolter (2007). Fisheries Management and Ecology 14: 483–494. Buijse, A.D., F. Klijn, R.S.E.W. Leuven, H. Middelkoop, F. Schiemer, J.H. Thorp & H.P. Wolfert [eds.] (2005) Archiv für Hydrobiologie Supplement 155 (Large Rivers 15). 738 pp. Geest, G. J. van, H. Coops; R.M.M. Roijackers; A.D. Buijse & M. Scheffer (2005). Journal of Applied Ecology 42: 251-260. Geest, G.J. van, F.C.J.M. Roozen, H. Coops, R.M.M. Roijackers, A.D. Buijse, E.T.H.M. Peeters & M. Scheffer. 2003. Freshwater Biology 48: 440-454. Roozen, F.C.J.M., G.J. van Geest, B.W. Ibelings, R. Roijackers, M. Scheffer & A.D. Buijse. 2003. Freshwater Biology 48: 519-531. 2011- present member Steering group The Netherlands. Dutch Platform Stream and River Restoration. 2011- present PresentDeltares research coordinator eco-engineering The Netherlands. 2008 - 2010 Deltares Deputy head of the department of Freshwater Ecology and Water Quality The Netherlands. 2006 - 2008 coordinator lowland-midland GIG, national representative Europe. WFD - Intercalibration River Fish. 2006 - 2008 Secretary the Netherlands. Interministerial Directors Consultation regarding fish-related issues. 2002 -2005 Coordinator ‘Rehabilitating large regulated rivers’. Organising an international conference and guest-editor of peer-reviewed proceedings. 2006 - 2010 National epresentative Belgium. Benelux expert group fish migration.